Abstract: Human induced pluripotent stem cell (iPSC)-derived cardiomyocytes represent a promising model for in vitro prediction of cardiac arrhythmias. Currently, two commercially available hiPSC-derived cardioymocyte products - including Axiogenesis Cor.4U human cardiomyocytes - are validated in an international multi-coresite study inside the comprehensive in vitro Pro-arrhythmia (CiPA) consortium. 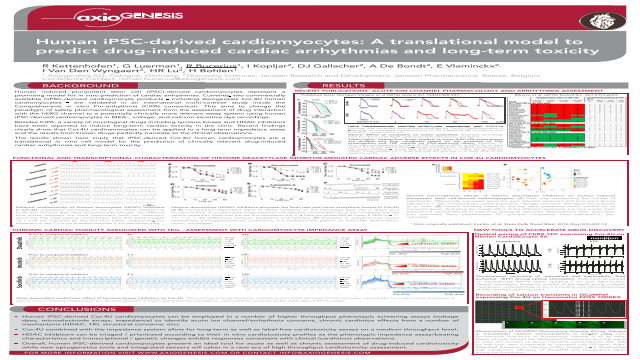 This aims to change the paradigm of safety pharmacological assessment from the assessment of drug interaction with the hERG channel to a potentially clinically more relevant assay system using human iPSC-derived cardiomyocytes in MEA-, voltage- and calcium-sensitive dye recordings. Besides CiPA, a variety of oncological drugs including tyrosine kinase and HDAC inhibitors have been reported to induce long-term cardiac toxicity in the clinic. Recent findings clearly show that Cor.4U cardioymocytes can be applied to a long-term impedance assay and the results from known drugs perfectly translate to the clinical observations.